Sometimes when travelling you may want that slightly more sophisticated edge to your travelling experience: visiting a fabulously stylish city for example or a luxury hotel. As a backpacker and now a flash-packer* (see here for a wiki definition.) I relish good quality travel products. 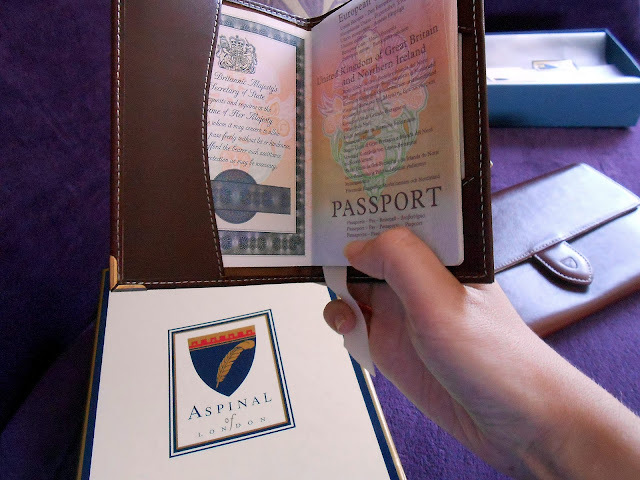 Aspinal Of London does everything with style. Earlier this year I was blessed with the good fortune to win a deluxe travel gift-set from a page on Facebook and I was blown away with the sheer quality of the travel items they sell. I think I have a bit of an inner travel 'snob' coming out of me in my middle 30's and this luxurious set ticked all my happy travelling boxes. So I bring to you the Aspinal of London Deluxe UK Travel Collection. Time to don those cool shades, step into the luxury traveller's world for a moment, and set sail for some distant shore. One thing I love about good companies is how they bring the product to you. Look at how beautifully wrapped this gift-set was when it arrived at my door. 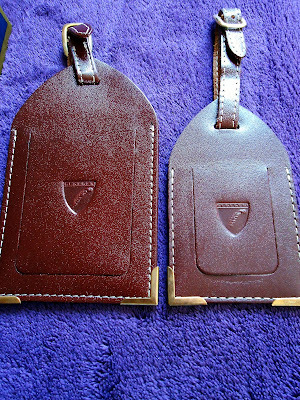 2 Luxury leather Aspinal Of London luggage tags. 1 Luxury leather Aspinal Of London passport cover. And an ultra elegant travel wallet made from Cognac colour calfskin leather and luxuriously lined in moire silk and soft suede. Oh my! Doesn't that send chills down your back? I was beaming from ear to ear when I received it. I have fond memories of the times of visiting airports when younger with my parents. The time when airports in my local area had only 1 or 2 gates and only one duty free shop. I remember sitting in the departure lounge and there only being a small cafe. But oh! Do I remember the smell? Airports had a different smell back then. No large perfume stores and fashion chains, just you sitting, waiting for your departure. I remember this lovely smell. It almost smelt like photo developing fluid combined with luxurious leather. Perhaps it is just my memory, does anyone else remember this? 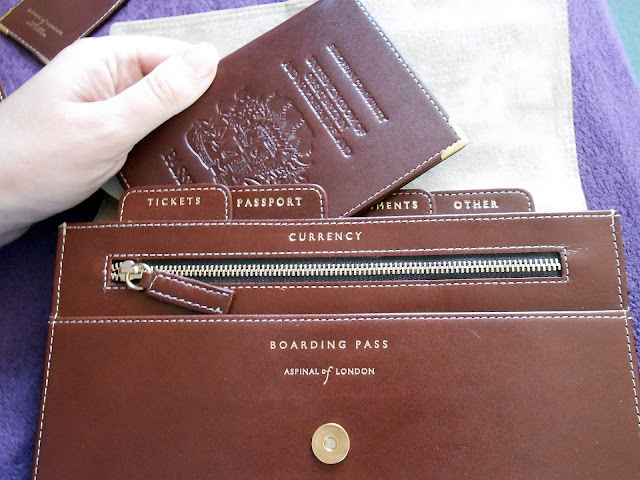 Aspinal's attention to detail and quality remind me of the way travel once was. It brings many fond memories flooding back to me. The little details on this luxurious gift set and engraving really set it apart. 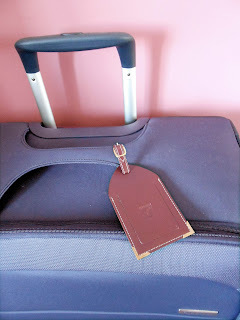 You can also get your travel accessories engraved with your initials for that extra personal touch. 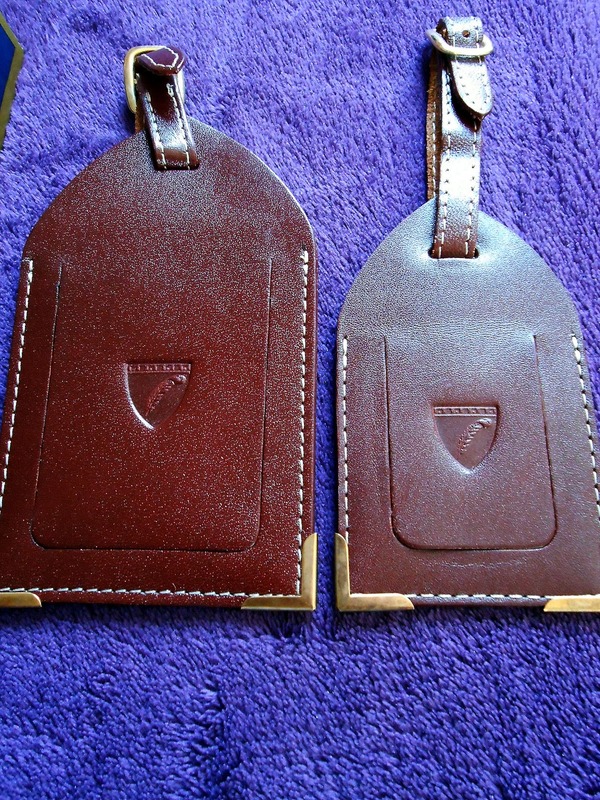 The luggage tags are well sealed, which keep the address details secure and you get one large for your suitcase and one small for your hand luggage. The luggage tags have an easy belt-style loop for attaching to luggage and stunning attention to detail with gold corners and perfect stitching. The leather passport cover is the height of style. As you can see from the first photo in this post the engraving is exquisite and the passport slides into the holder very easily (see below). Prior to receiving the perfectly sized travel wallet, I used to use all kinds of wallets and sleeves when travelling. Some brands made wallets that were not wide enough for my passport and flight information, and I ended up losing my documents in the bottom of my handbag. This travel wallet is large enough and very well organised. The travel wallet is even large enough for the passport (with the cover on) to easily slide in and fastens shut with a secure snap closure. It is lined with soft-suede and moire silk. This wallet is a traveller's saviour for organisation as you can see, and very durable for long-term travel. Very well made. 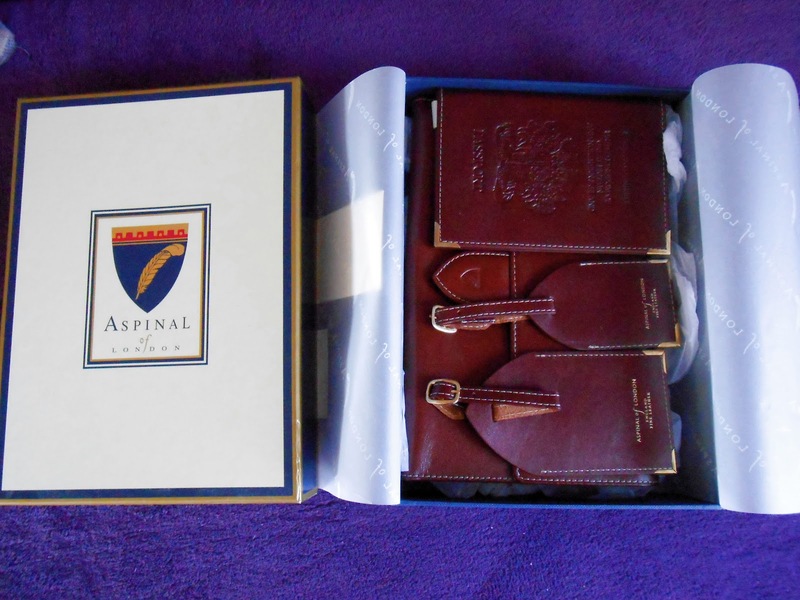 So, to summarise my experience of the Aspinal Of London Deluxe Travel Set, I would say that if you have the resources these items will never go out of fashion and will stand the tests of time in terms of longevity. 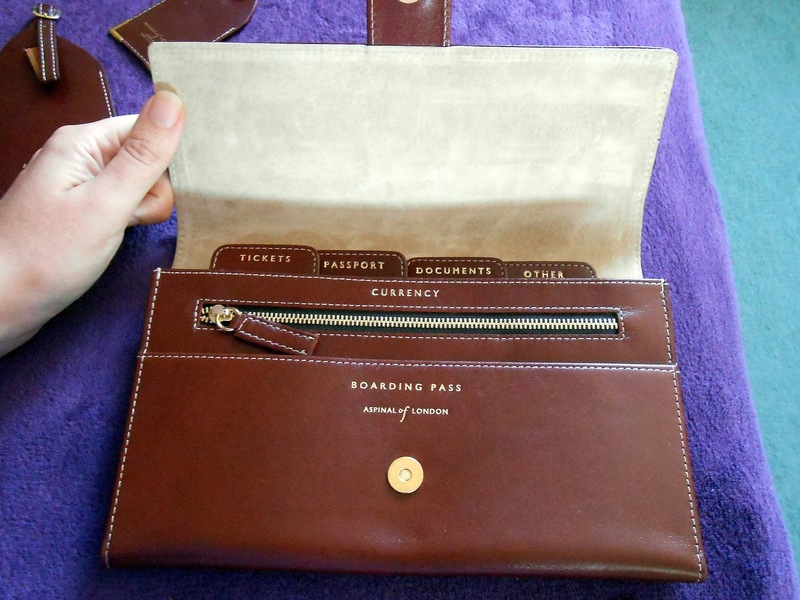 A perfect gift for oneself or a fellow lover of travel. Check out the Aspinal Of London's website for more information on the products they sell (be prepared to sigh at the beauty - I did!). The above set currently retails for £150. 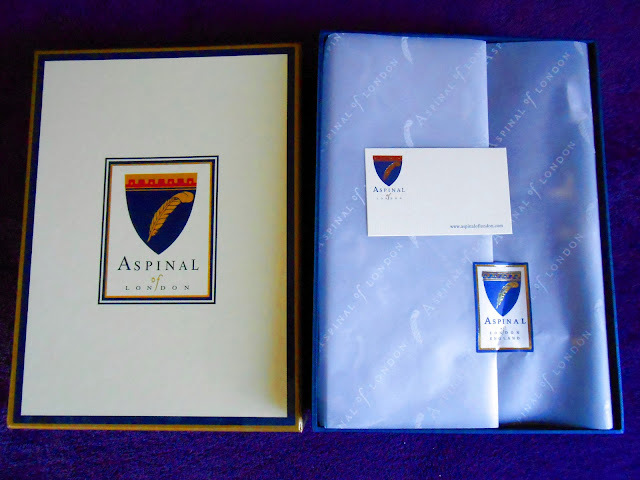 *This review was carried out on the Aspinal of London's Deluxe Travel set. 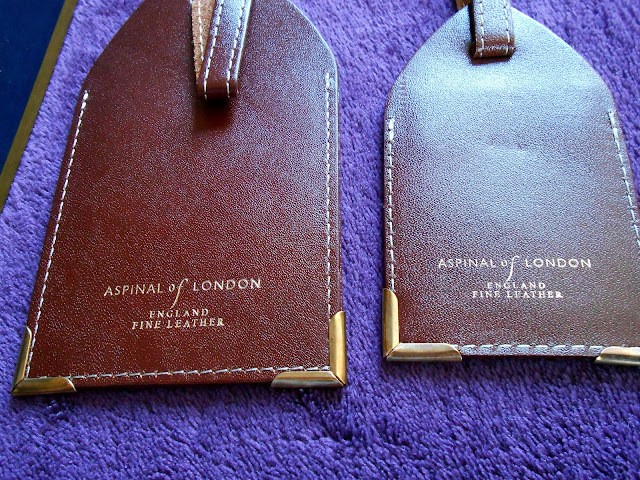 This was not donated by Aspinal of London and is an honest representation of my personal experience of this set. Interesting review. I see that you have reviewed just the embossed version. I purchased passport covers with the gold embossing on it. The foil used had adhered to the cover in a number of places. Fortunately my father in law is a printer and knew exactly what the issue was. 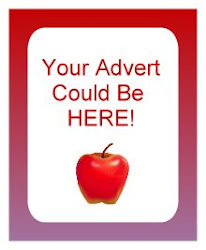 I returned the cover to Aspinal but they couldn't see the issue at all saying all their red covers were like this. It would seem that they don't have any quality control as the problem was clear to see. 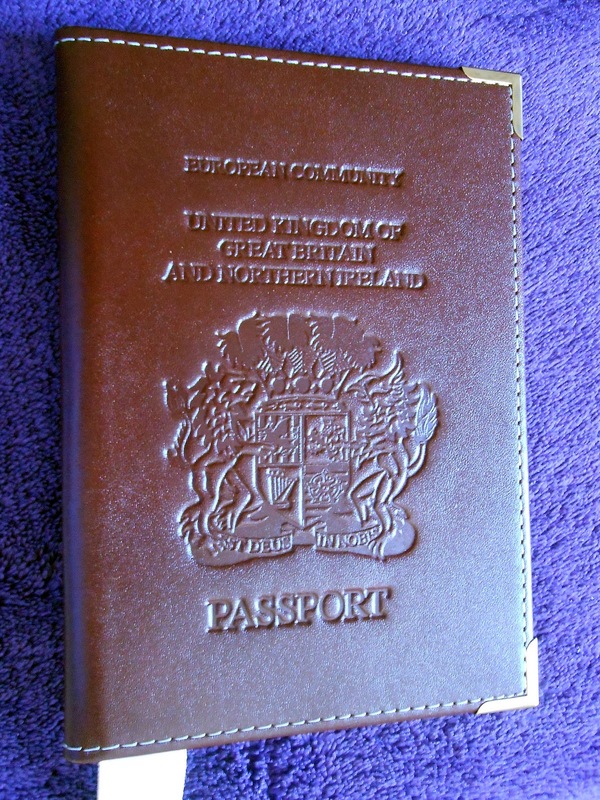 Given that the passport covers were £45 I expected better. Personally I would steer very clear of them. There are other alternatives on the market which are either more costly but of better quality or a more reasonable price for similar quality.